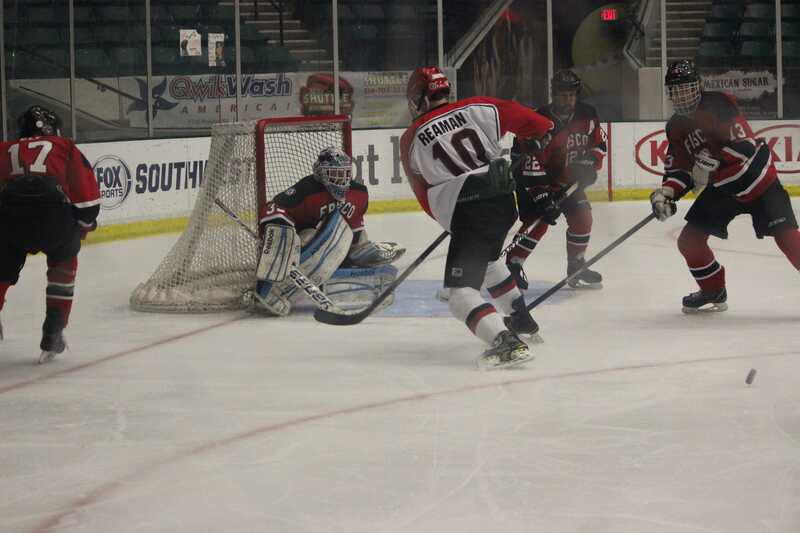 Junior forward James Reaman shoots the puck at the opposing goal in a playoff game against Frisco on Mar. 3, 2015. Coppell lost 1-0, eliminating them from the playoffs. Photo by Kelly Monaghan. On Thursday night, the Coppell hockey team squared up against John Paul II in a matchup that did not disappoint. In an exhilarating 6-5 shootout win, the Cowboys scored two of three shootout goals and goalie Robert Longbotham allowed five goals on 29 shots against him. After an early goal from John Paul II, Coppell went on a 4-0 run including three goals in the second period, yet allowed three third period goals. 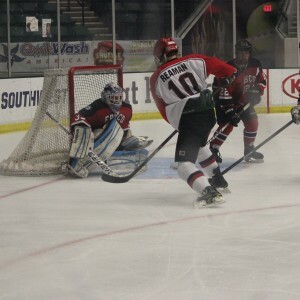 Coppell senior forward Raismus Raikaa scored twice in regular time and hit a shootout goal to give him three total goals in the game to give him six on the season. With the win, Coppell is 9-1 on the season and in first place of the varsity gold division. Coppell has a plus-20 goal differential and already has two overtime wins on the season.